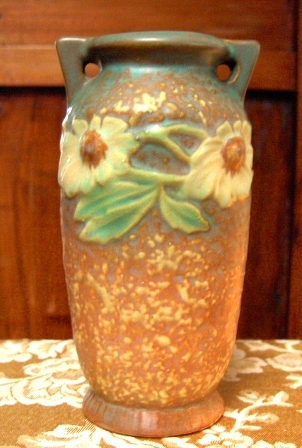 We bought our first Roseville vase twenty-eight years ago in Milwaukee, Wisconsin at an Antique Barn just off the tollway. It was on a whim as we hadn’t planned on stopping or shopping on our way home to Chicago. The vase, a Snowberry Urn, to this day stands proudly on our fireplace mantel joined by fifteen other Roseville treasures. We paid all of $25.00 for it and at the time that was a lot of money. But it has given us many years of pleasure by showcasing countless hand-picked bouquets from the gardens we have tended. 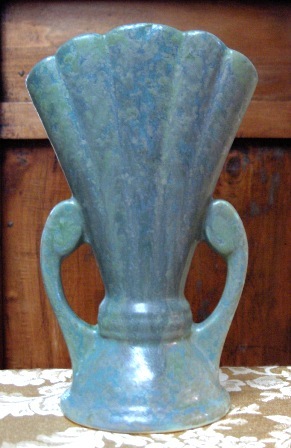 To this day each time I purchase a Roseville vase, console or candle holder something inside of me is stirred. Sometimes it’s an appreciation of the design lines, other times a sense of awe at the way Roseville was able to capture the beauty of so many floral gifts of nature. A sense of time in history is often stirred by a particular pattern: the simplicity of the Arts & Crafts period shown in the Green & Color Matte series of vases or the right-on-target Art Deco expressions in the Futura Line. I suppose it is for these reasons that Roseville has become my benchmark for evaluating all other pottery. I suppose that it is the reason that Billy Blue Eye proudly offers such a wide selection of Roseville Pottery at the monthly Flea Markets in Long Beach, California. The three Roseville vases pictured here are new acquisitions and will be available this Sunday, February 21st, at the Long Beach Antique & Collectible Market. Held from 6:30 AM to 2:00 PM in the Veteran’s Stadium Parking lot, visit our green and white tent, booth A-853. 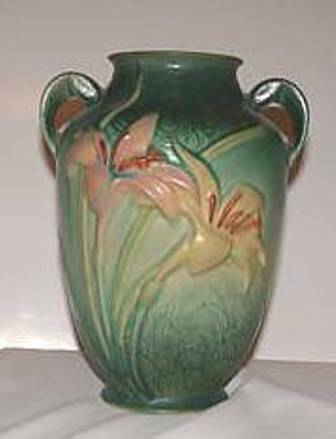 In addition to Roseville Pottery, Billy Blue Eye will have over 300 pottery items for sale including McCoy, Weller, Beswick, Royal Haeger, Van Briggle, Red Wing, Catalina, Bauer, and Rookwood vases, bowls, wall pockets and art objects. I love the style of the “Carnelian II”. It has such a nice texture to it. The lip on “Dahlrose” is really fun to. It’s always interesting to hear about the treasures we find at antique shops and flea markets. Anyways, beautiful pieces, hope they went to a good home.